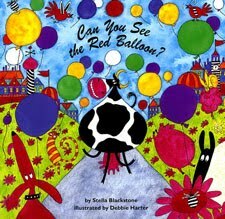 Brimful Curiosities: Kids' Picks July 2010 - Paddiwak and Cozy & Can You See the Red Balloon? Kids' Picks July 2010 - Paddiwak and Cozy & Can You See the Red Balloon? 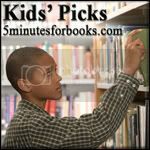 We are participating in 5 Minutes For Books Kids' Picks this month, so it is time to share a couple of the Brimful kids' favorite July library finds. Interestingly enough, both books are written by authors from England. "Paddiwak yawned and slid off his chair. He sniffed at the box with the noisy feet. The lid flipped up and out came a whisker and two and three and four and more of another cat." Paddiwak the cat thinks he rules the roost until his owner, Sally, brings home a special present and out jumps another cat named Cozy. The "getting acquainted" period doesn't go as Sally plans. Paddiwak isn't fond of the idea of a new friend and runs out the door, repeatedly proclaiming, "I'm never, never, never going home again." Cozy, like most cats trying to adjust to new surroundings, appears frightened and distressed and immediately goes into hiding. Change isn't easy for either cat, but each finally finds a cozy place to rest. More often than not, my daughter picks out books about animals, especially cats. She usually chooses her books based on the cover illustrations and this one, with the two distinguished and realistic looking cats, instantaneously caught her eye. 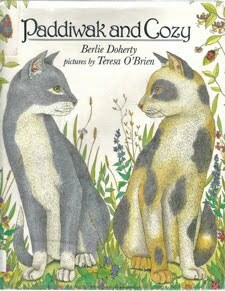 We were very happy to learn from Doherty's website that the book is a true story about two of her cats. The exquisite and highly detailed watercolor-and-ink drawings really do capture both cats' personalities and there is much to pour over in each illustration, from tiny bugs and little mice to interesting cat paintings hanging on the wall. 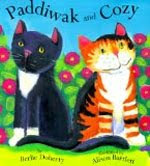 The rhyming, poetic text is fun to read aloud and we just adore the names of the two cats - Paddiwak and Cozy sound like opposites but the names fit together so nicely. With underlying themes of jealousy and trust, this is a good book about developing friendships. For some reason, this book was later republished in 1999 with different illustrations by Alison Bartlett. I think we prefer the original, more realistic and delicate illustrations...they just seem fitting for a book about two grown cats. Be sure to take a look at author Berlie Doherty's website and learn about all her books: http://www.berliedoherty.com/. She has won the Carnegie Medal twice. My daughter thinks we need to adopt another cat since our female cat, Katy, passed away last fall. I'm not so sure that "Mr. Fuzzypants," the remaining cat, desires a new companion at this time. 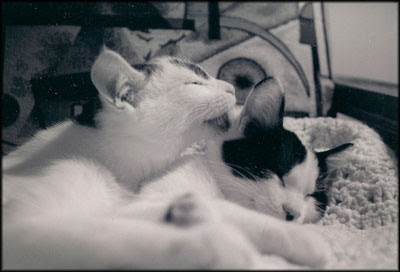 Here is a picture of our cats cozied up together when they were kittens. My toddler son is very interested in colors all of the sudden. This silly and fun search-and-find book about colors appeals to him greatly, and we've read it together several times. Each busily illustrated page spread is devoted to a different color. For instance, readers search for red objects like a red dog and a red plate on the first pages and then turn the page to look for white objects. The book helps teach color recognition and also helps increase vocabulary with more unusual words like fenders, tiles, carriage and streamers. There's so much to look at on each page it's dizzying, but in a good way. There's not much in the way of text - only instructions about what objects to look for. Cow lovers rejoice...the book stars Florence, a humorous black-and-white cow that hides (as well as a spotted cow can) in each illustration. Holstein cows are familiar sight around here and my kids always enjoy books featuring this distinctive breed. My daughter loves animal books as well. She is trying to convince her dad to let us have a dad, but so far, it's not working. Happy Readging! Wow, I liked the cartoonish illustrations, because I had seen them first (scrolled down), but then I looked back up at the original, and they are beautiful! I was sooooo excited to see a posting about cat literature!! We love cats here at our house! Thank you for this wonderful post and the amazing book selections!